The Jeep Compass has forged a path of its own, one full of style, capability, and comfort. This SUV has all of your favorite Jeep attributes while throwing in some unique exterior features. There's something to be said for any Jeep SUV, but most notably the newer models that have found their own niche. One of the best parts of the 2019 model are the fully outfitted four trim level options. No matter what kind of SUV you're looking for, a commuter or an off-roader, the Compass has a trim ready for you! If you're interested in learning more about the four trim levels, keep reading down below! The base model for the Compass is the Sport. This trim, like every trim, comes with a 2.4-liter 4-cylinder engine, which can output 180 horsepower and 175 pound-feet of torque. Front-wheel drive comes standard, while all-wheel drive is optional. You'll also most likely be getting a six-speed automatic transmission. A six-speed manual transmission is also available. The standard features with the Sport include a Uconnect system with a seven-inch touchscreen display, 16-inch wheels, a 6-speaker sound system, Bluetooth connectivity, air conditioning, and a USB port. The Latitude trim also comes with a six-speed manual transmission as an available feature. You'll also find added features like upgraded simulated leather and cloth seat upholstery, keyless ignition and entry, larger wheels, a leather-wrapped steering wheel, and further choices through packages. The most luxurious trim available is the Limited. This trim is comprehensively equipped, getting you an upgraded driver information display, 18-inch wheels, a heated steering wheel, an 8.4-inch Uconnect touchscreen with Android Auto and Apple CarPlay, heated front seats, automatic dual-zone climate control, leather upholstery, remote start, satellite radio, a power-adjustable driver's seat, and upgraded exterior trim. For anyone looking for a Compass that can tackle off-road terrains, you need to check out the Trailhawk. This trim not only comes with all-wheel drive as standard, but it also features a nine-speed automatic transmission. Other added features, which help the Trailhawk in its quest to conquer the trails, include red tow hooks, 17-inch wheels with off-road oriented tires, a Selec-Terrain system, a matte-black hood accent, underbody skid plates, and a raised suspension. There are more features that are available throughout the different trim levels. This includes the Advanced Safety package, which adds lane departure intervention and warning, adaptive cruise control, forward collision mitigation and warning, and automatic high beams. You can also add a navigation system, a power liftgate, xenon headlights, a sunroof, a Cold Weather package, and a premium Beats audio system. 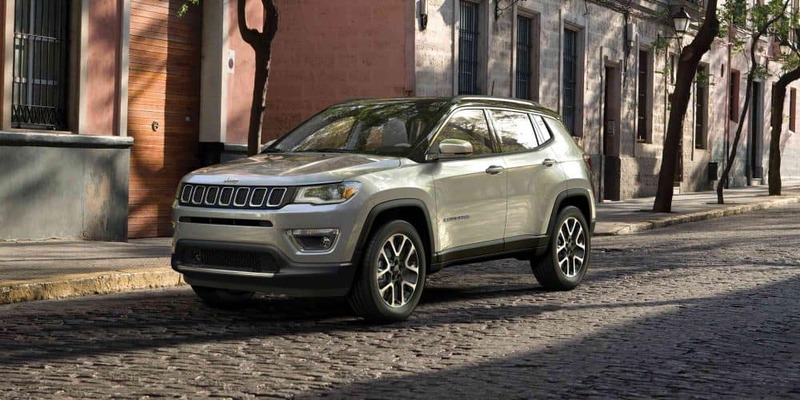 If you're interested in choosing one of these trims, and owning a 2019 Jeep Compass of your very own, then check out our Compass inventory! These SUVs are incredibly flexible, and can adapt to any environment. You can guarantee that, thanks to the storied history of Jeep. Give us a call if you're interested in learning more!